Americans are losing faith that the housing crisis that began nearly a decade ago is over. A significant majority (81%) continues to believe that housing affordability is a problem in America today, according to a new survey of housing attitudes released today by MacArthur. While stable, affordable housing is viewed as a fundamental component of economic security for American families, nearly seven in ten adults (68%) believe that it is more challenging to secure such housing today than it was for previous generations. 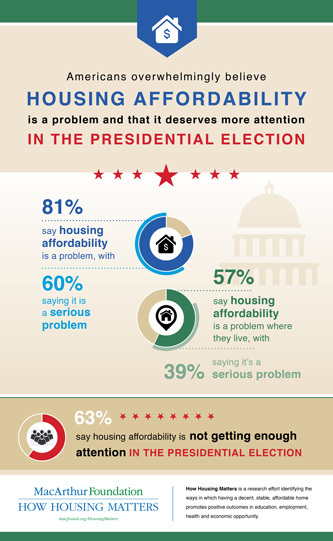 Still, more than three in five adults (63%) believe a great deal or fair amount can be done to address problems of housing affordability, and the same proportion (63%) believes this issue has not yet received enough attention from presidential candidates. The 2016 How Housing Matters Survey is the fourth annual national survey of housing attitudes commissioned by the MacArthur Foundation, this year with additional support from the Kresge Foundation and the Melville Charitable Trust. Hart Research Associates interviewed 1,200 adults, via landlines and cell phones, between April 28 and May 10. An additional oversample of 603 respondents in the City of Chicago and its suburbs was undertaken, and its findings were also released today. In a reversal of previously growing optimism that “the housing crisis is pretty much over,” only 29% of adults now believe this is the case, down six percentage points from last year. Nearly two-thirds of those surveyed believe we are still in the middle of the housing crisis (44%) or the worst is yet to come (19%). The proportion of Americans who believe the crisis is over had been steadily increasing, from 20% in 2013 to 25% in 2014 to 35% in 2015, before trending down this year. While this decline in optimism about the end of the housing crisis prevails across most segments of the public, it is especially pronounced among renters (-12-point difference from 2015), those 65 and older (-12), those with a four-year college or more education (-10), African Americans (-10), Hispanics (-13), city dwellers (-13), and those living in the Northeast (-10). A significant majority (81%) continues to believe that housing affordability is a problem in America today, with six in ten characterizing it as a serious problem. A majority of adults (57%) say that housing affordability is a problem in the area in which they live, with two in five (39%) calling it a serious problem. Stable, affordable housing is viewed as a fundamental component of economic security for families, yet Americans find that it is increasingly unattainable. When asked what things are very important in achieving a secure, middle-class lifestyle, stable, affordable housing (85%) falls just behind a good job (90%) and in line with saving for retirement (85%) and having health insurance (83%). Yet seven in ten adults (68%) believe it is more challenging to secure such housing today than it was for previous generations – a belief held across all educational, income, regional, and demographic cohorts. Americans are optimistic that the problem of affordable housing is solvable and are solidly behind a variety of policy proposals to address these challenges. They do not believe, however, that the problem is receiving the attention it needs or deserves. Nearly two-thirds of adults (63%) believe actions can be taken to solve problems of housing affordability, and a significant majority (76%) believes it is very (60%) or fairly important (16%) for their elected leaders in Washington to do so. The view that affordable housing should be a priority among policymakers is strong across the political spectrum – from most Democrats (88% say it is very/fairly important for leaders to act) to three-fourths of Independents (75%) to a solid majority of Republicans (62%). Homeowners (71%) and renters (86%) also agree. Yet 63% of adults say this issue has not received enough attention from the 2016 presidential candidates, including half of Republicans (49%), two-thirds of Independents (66%), and three-quarters of Democrats (74%). As key indicators of how difficult it is to acquire and maintain stable, affordable housing today, one-third of adults (34%) report that they know someone who has or have themselves been evicted, foreclosed upon, or lost their housing in the past five years. Three in ten adults (31%) spend more than 30% of their monthly household income on their rent or mortgage payment. Again this year, over half of the public (53%) report that they have made sacrifices over the past three years to be able to cover their rent or mortgage. These sacrifices have included taking on an additional job/more hours at work (24%), ceasing to save for retirement (19%), Accumulating credit card debt (17%), or cutting back on healthy food (13%) or healthcare (11%). While half of college graduates report having had to make such sacrifices, proportions of those who have had to do so are higher for people with high school diplomas or less education (57%), some college (60%), those with incomes under $40,000 (66%) or even $40,000 to $75,000 (58%). African Americans (63%) and Hispanics (72%) are struggling, as are renters (71%), city dwellers (60%), and those paying more than 30% of their income to cover housing costs (76%). The survey finds that 16% of adults feel only somewhat stable and secure or unstable and insecure in their current housing situation – this represents more than 37 million Americans. Groups experiencing this housing vulnerability at especially high rates include 33% of renters, 42% of distressed renters (those who spend more than 30% of their income on rent), 30% of adults with income less than $40,000, 23% of adults with a high school degree or less education, 34% of African Americans, 24% of Hispanics, and 23% of city dwellers. A wide swath of respondents support a variety of proposed policies that local, state, or the federal government could take to address housing affordability, a reality that underscores the importance the public places on political leaders fixing this lingering, serious problem. Strong majorities favor revising the tax code to help those earning between $40k and $70k to buy homes (total support 81%); expanding housing support for low-income families with children (80%); letting developers build more units if they include some targeted to families earning less than $50,000 (79%); requiring communities to ensure 20% of housing is affordable to families earning less than $50,000 (74%); ensuring programs such as the Earned Income Tax Credit provide income assistance to cover housing costs (74%); expanding rental housing assistance (73%); or giving renters a federal tax break similar to the mortgage interest deduction (70%). The pendulum continues to swing back toward the belief that owning a home is an excellent long-term investment, with 60% of adults believing so, up 10% since 2014. As recently as 2013, a majority of the public (57%) said that buying a home was becoming less appealing. “This year’s How Housing Matters survey reveals a surprising reversal of the trend in which Americans have been feeling more optimistic about the housing recovery, and concerns about housing affordability have remained remarkably durable. It is understandable why so many Americans are still skeptical about the housing recovery. Stable, affordable housing equates to feelings of security and having achieved a middle-class lifestyle, yet as Americans continue to make sacrifices to keep their homes. Americans want their elected officials to focus more on the challenge of affordable housing, and they think the issue has not so far received the attention it deserves from the candidates,” said Geoffrey Garin, President of Hart Research Associates.